The research about this possible relic from the Hadean Earth is published today in the journal Earth and Planetary Science Letters. An international team of scientists associated with the Center for Lunar Science and Exploration (CLSE), part of NASA's Solar System Exploration Research Virtual Institute, found evidence that the rock was launched from Earth by a large impacting asteroid or comet. This impact jettisoned material through Earth's primitive atmosphere, into space, where it collided with the surface of the Moon (which was three times closer to Earth than it is now) about 4 billion years ago. The rock was subsequently mixed with other lunar surface materials into one sample. The team's analyses are providing additional details about the sample's history. The rock crystallized about 20 kilometers beneath Earth's surface 4.0-4.1 billion years ago. It was then excavated by one or more large impact events and launched into cislunar space. Previous work by the team showed that impacting asteroids at that time were producing craters thousands of kilometers in diameter on Earth, sufficiently large to bring material from those depths to the surface. Once the sample reached the lunar surface, it was affected by several other impact events, one of which partially melted it 3.9 billion years ago, and which probably buried it beneath the surface. The sample is therefore a relic of an intense period of bombardment that shaped the solar system during the first billion years. After that period, the Moon was affected by smaller and less frequent impact events. The final impact event to affect this sample occurred about 26 million years ago, when an impacting asteroid hit the Moon, producing the small 340 meter-diameter Cone Crater, and excavating the sample back onto the lunar surface where astronauts collected it almost exactly 48 years ago (January 31 to February 6, 1971). 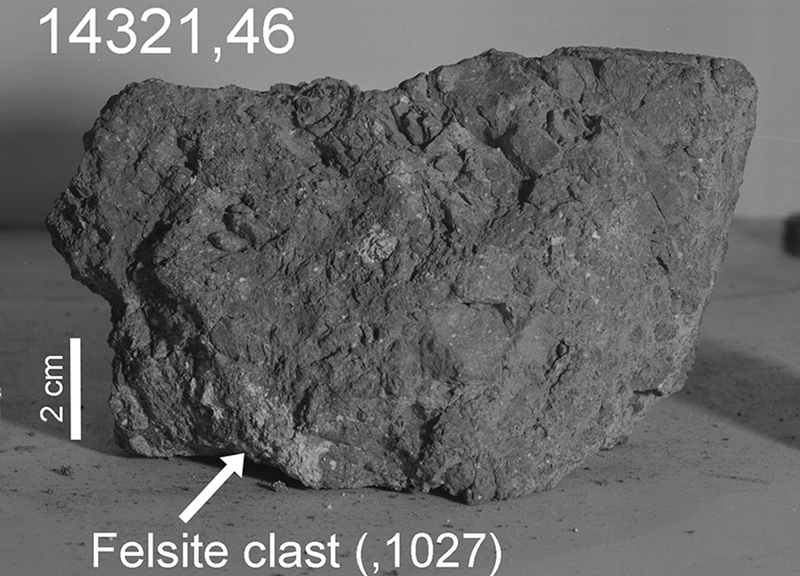 Reference: "Terrestrial-like Zircon in a Clast from an Apollo 14 Breccia," J. J. Bellucci et al., 2019 Jan. 24, Earth and Planetary Science Letters [https://doi.org/10.1016/j.epsl.2019.01.010, https://www.sciencedirect.com/science/article/pii/S0012821X19300202]. Dr. Katharine Robinson, a postdoctoral researcher at the LPI, was also involved in the study, as were Dr. Marion Grange (Curtin University), Dr. Gareth Collins (Imperial College London), Dr. Martin Whitehouse (Swedish Museum of Natural History), Dr. Josh Snape (Vrije Universiteit Amsterdam), and Prof. Marc Norman (Australian National University). The research is supported by NASA's Solar System Exploration Research Virtual Institute (SSERVI) through a cooperative agreement with the CLSE, a joint venture between the LPI and NASA's Johnson Space Center. Founded in 1969, under the auspices of the National Academy of Sciences at the request of the U.S. Government, the Universities Space Research Association (USRA) is a nonprofit corporation chartered to advance space-related science, technology and engineering. USRA operates scientific institutes and facilities, and conducts other major research and educational programs, under Federal funding. USRA engages the university community and employs in-house scientific leadership, innovative research and development, and project management expertise. More information about USRA is available at http://www.usra.edu. The Lunar and Planetary Institute (LPI), operated by Universities Space Research Association, was established during the Apollo program to foster international collaboration and to serve as a repository for information gathered during the early years of the space program. Today, the LPI is an intellectual leader in lunar and planetary science. The Institute serves as a scientific forum attracting world-class visiting scientists, postdoctoral fellows, students, and resident experts; supports and serves the research community through newsletters, meetings, and other activities; collects and disseminates planetary data while facilitating the community's access to NASA science; and engages and excites, and educates the public about space science and invests in the development of future generations of explorers. The research carried out at the LPI supports NASA's efforts to explore the solar system. More information about LPI is available at http://www.lpi.usra.edu.